No, this isn’t science class (though you will learn some biology today), scapular retraction doesn’t have anything to do with chemical reactions or photosynthesis. “Scapular retraction” is simply a fancy way of describing the motion of bringing your shoulder blades back and together. Your shoulder blades are scientifically named scapulae (scapula singularly). Retraction is the motion of pulling back. Think of the expression of “retracting a statement”, that is to take, or pull it back. Your scapula, or shoulder blades, are located on either side of your back. If you put on hand on your upper back and shrug, you’ll feel your scapula coming up. If you stand with your elbows out and try to make them touch behind your back, you’ll feel your shoulder blades coming back and together and your chest pushing out a bit. This is scapular retraction, the main theme of our discussion today. The scapulae are not muscles, they are bones; but, they are covered with muscles like the trapezius and latissimus dorsi that enable the scapula to move vertically, abduct, adduct, as well as to retract and protract. Your scapula and surrounding muscles retract when pulling something into your body and moving your elbows back, they move up when you shrug, and they protract when you reach in front of your body. What benefits could squeezing your shoulder blades together have? Well, you might be surprised. First and foremost, having a good understanding of scapular retraction will help you make your back exercises more effective. You’ve probably read or been instructed to squeeze your shoulder blades together on an exercise, and having a good understanding of how to do this will help you to increase that mind-muscle connection and get the best benefit for your lats and trapezius out of the exercise. If you’re having trouble connecting the dots, have someone place their hand in between your shoulder blades and try to squeeze their hand with your scapulae. This is a simple exercise and can really unlock scapular retraction for those who have difficulty establishing that mind-muscle connection. In addition to making back exercises more effective, scapular retraction can help with several other big lifts. Having a good command of scapular retraction will help you bench more. If your shoulder blades are protracted during the bench press, you are placing your shoulders in front of the chest and recruiting more of your shoulder muscles, which are weaker than your chest muscles, during the exercise. 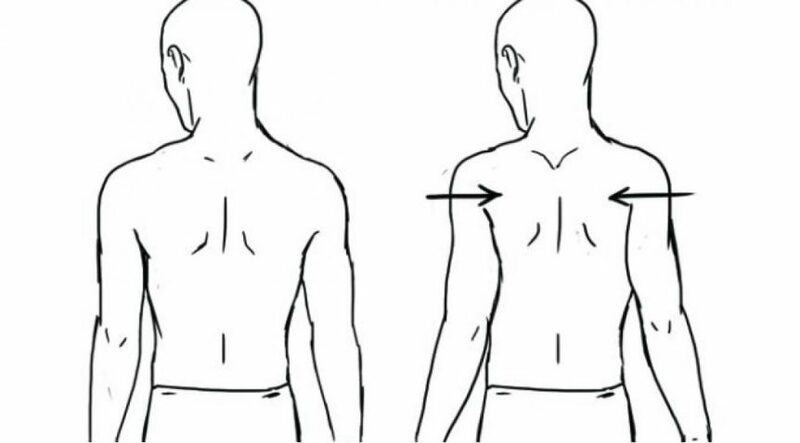 By pulling those shoulder blades together, you not only create a stronger and more stable base, you move the chest in front of the shoulders and engage the chest muscles more into the lift. If you’re using a stronger muscle as the primary mover on an exercise than previously, you will progress faster and those plates will start to stack up. Your bench isn’t the only lift that will benefit from proper scapular retraction, as it is also important in squats. “Why do the shoulder blades matter in a leg exercise?”, you may be thinking. 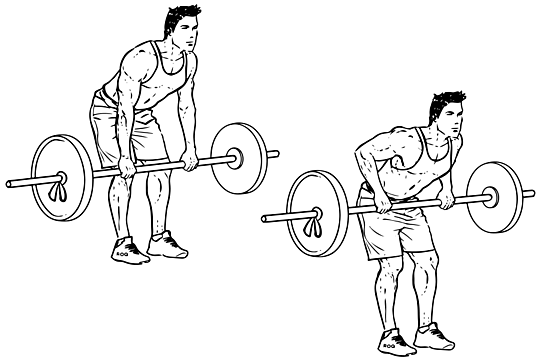 What does the bar sit on during squats? That’s right! Your upper back and scapula. Squeezing your shoulder blades together on the squat gives the bar a steady and stable platform, which makes it easier to keep the bar still and level – keeping your legs involved with moving the weight and saving your knees and hip flexors from trying to keep the bar from swaying or tipping. My favorite benefit of scapular retraction, and arguably the best and most practical for day-to-day life, is the benefit of correcting your posture. Several fitness enthusiasts and lifters develop rounded shoulders (like the buff guys who walk around like bulldogs), and this can cause discomfort, pain and serious back problems in the long term. Focus on keeping your chest open and out front with your scapula slightly retracted as a practice in postural correction. Developing this habit can save you from several mild and severe back problems down the road, and it also projects confidence. 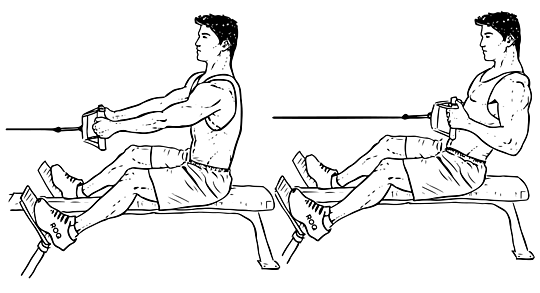 The seated cable row is a great, controlled way to work on scapular retraction. Seated cable rows engage your upper and middle back muscles. Make sure to get a good stretch on the negative portion of the rep and really focus on pulling those shoulder blades back and together when you’re pulling that weight into your chest. This exercise has been a favorite of the fitness community for a quite some time due to deep stretch you can get on the negative part of the repetition. Free weights like dumbbells also engage stabilizer muscles more than machines and cable/pulley exercises. Make sure to keep your back straight on these and keep your elbows in tight to engage those scapula retracting muscles. Focus on moving the weight with your elbow, not your hand, this will ensure you’re not engaging the bicep too much. So you’ve exhausted the dumbbell supply, or just want to go heavy and really challenge your trapezius and latissimus dorsi muscles retracting those scapulae – this is where barbell rows come in. Making sure to keep that back flat and bending over at the hips, not your waist, are good form cues to remember. 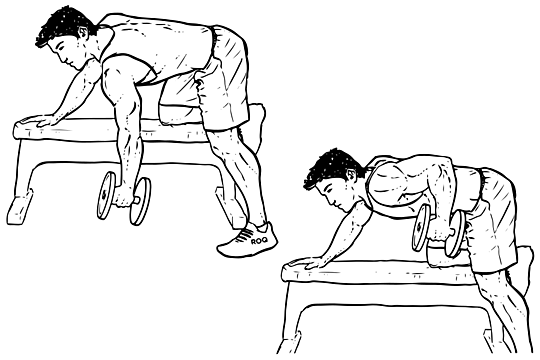 As with the single-arm dumbbell rows, keep the elbows in tight and lift the weight with the retraction of your scapulae and backwards movement of your elbows, not your biceps. Scapular retraction has several benefits to your lifts and day-to-day life, and whether you’re performing cable rows, single-arm dumbbell rows or one of the many varieties of barbell rows, you should be retracting your scapulae when necessary. Not only will this make you stronger and safer on your lifts, but it will correct your posture and help to keep your back injury free. List me all the exercises in which i should squeeze my shoulder blades together. Scapular retraction is a posture technique that should be used to ensure proper posture in nearly any exercise, so it would be pretty hard to list them all. While the technique is most often used with back exercises to ensure the best muscle ‘squeeze’, it can also help with chest exercises, shoulder exercises, and more.